What it’s about: Next door neighbors Quentin and Margo were childhood friends, but inevitably drifted apart. Now in high school, Q is a band geek who’s not in the band and Margo is popular and famous for her outrageous stunts. Also, Quentin is still in love with her. To Q, Margo Roth Spiegelman is revolutionary, spectacular, singular, and gorgeous. He also hardly ever speaks to her. One night, Margo appears at his window and takes him on a mad midnight revenge ride around Orlando. The next day she disappears. Q discovers that Margo has left clues about her whereabouts and believes that those clues are for him. Convinced that Margo wants him to find her, Q follows her trail, hoping he can bring Margo back before graduation and also come to understand the real person behind his ideal girl. 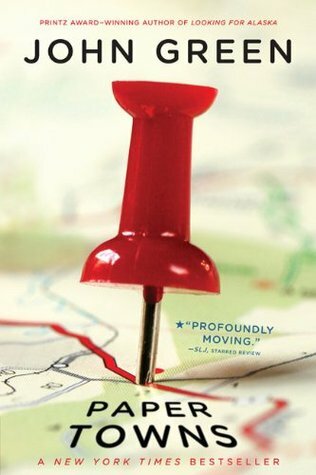 First, as a girl raised in Florida who is fairly familiar with the Orlando area, I loved the setting of this book. Orlando is, without a doubt, a paper town. The actual people who live there and the interesting lives they may lead are just totally eclipsed by the machine that is tourism. Theme parks, theme hotels, theme restaurants—everything is artificial. If you drill to the core, there are places with some authenticity, but they are practically smothered by the hollow wonderland. Central Florida is also something of a wasteland. With none of the benefits of the coast, it’s unrelentingly humid and swampy, conditions that only add to the hopelessness that breeds in Margo Roth Spiegelman and leads to her disappearance. But though Q makes much of Margo, she’s a paper character in this book, and we’re never close enough to her to even begin to understand her, which mimics Quentin’s struggle to figure Margo out. I like where Green takes the book, how he shows us how we invent others and that it can be difficult, if not impossible, to truly know another person. The teen years in particular seem rife with this problem. Green shows us a boy who quite clearly invents a girl. Oh, the flesh and blood person is there (until she’s not, of course), but his conception of Margo could never live up to an actual person. Though I think this phenomena is quite common, I found myself almost distractedly frustrated with Q and couldn’t help agreeing with his friends when they urged him to leave his search for Margo behind and enjoy his last few weeks of high school. As they pointed out, his obsession with Margo keeps him from his own life, taking but giving nothing. Would I recommend? I have to admit that I enjoyed Looking for Alaska more than Paper Towns and I’d recommend making that your first stop in the Green oeuvre. Paper Towns has the same wit and intelligence, but was a little less emotionally impactful for me at least. Others have mentioned it’s their favorite (his new The Fault in Our Stars excluded as it’s just been released…it’s on my list!) and I’d be interested to hear why other readers rank Paper Towns above Looking for Alaska.